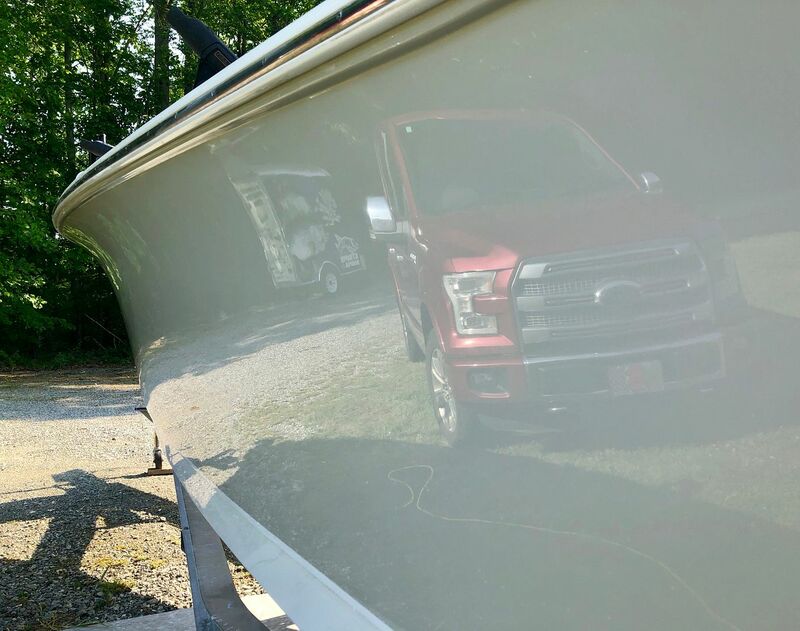 I have an 8 year old 24' bay boat that had seen some battle and it was time to take care of the scratches & scrapes. 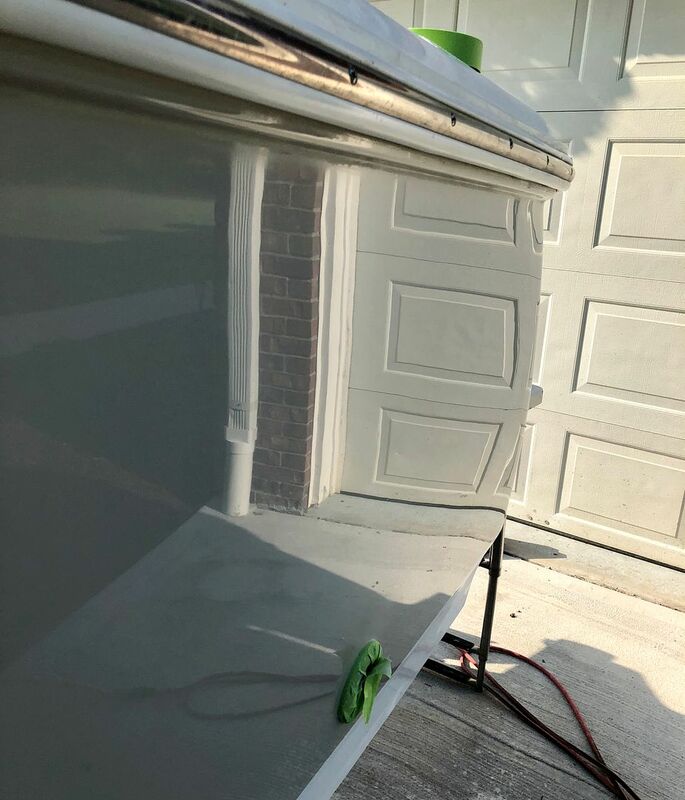 The boat is kept in a covered lift so the general gel-coat was in pretty good shape as far as oxidation goes, though the rear of the boat was pretty heavily faded. It had not seen a good polish in a few years, so it was time to give it a full service. I wet-sanded the small scratches out, and gel-coated the deeper ones - there were enough across the hull that I decided to go ahead and wet-sand the whole hull to ensure any deeper sanding scratches were out as well as take care of any oxidation that may have been there - started with 400 on a block, and then moved to 800 until I realized I could use my PC7424XP and wet-sand - so I'm not to the point where I've used the PC to wet-sand the whole hull with 600, 800 and 1500 - planning to then do a pass with 2000 and finally 3000. I have the Marine 31 Heavy-Cut Oxidation Cleaner and the Final Step Polish, along the the LC orange & white pads the came with the kit and a wool cutting pad. I also have bottles of the Meguiars 49 and 45. 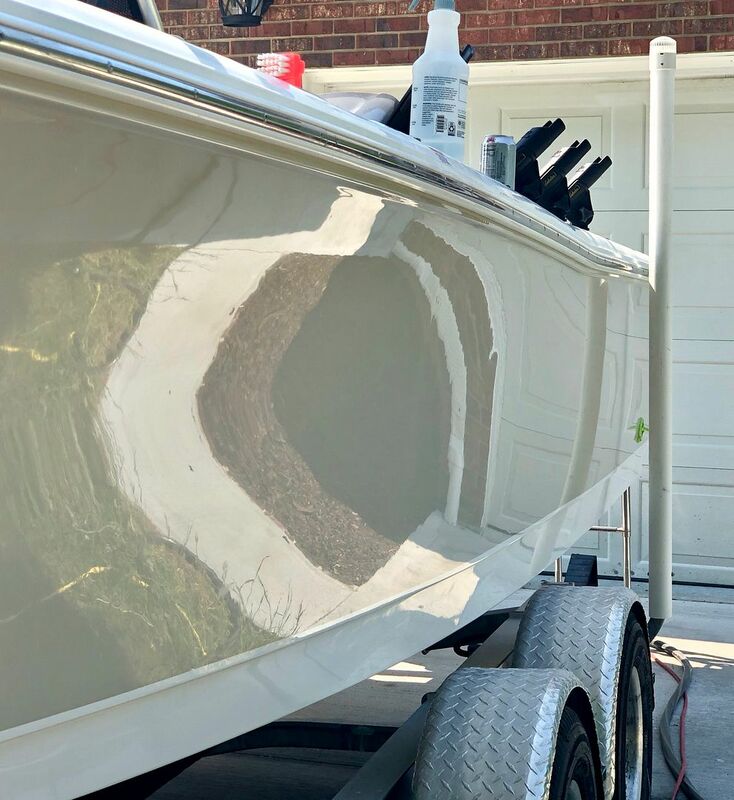 Given the state the hull will be in after finishing with the 3000, what is the best product to go with next (and with which pad - assume I'll be using the MinnKota polisher regardless). Well, I decided to plow forward with the kit I had..... after wet/damp sanding to 3000 grit with the PC7424XP I used the Marine 31 Heavy-Cut Oxidation Cleaner and a wool cutting pad on the Dewalt rotary polisher - this brought a lot of reflection & luster out of the gel-coat. I followed up with the white Lake & Country pad and the Marine 31 Final Step polish - which brought me to the point in the pics below. Honestly I did not see a lot of visible difference before & after using the polish. When I examine the surface close with a bright light I can see some "pig tails" from the wool pad that the polish & white pad did not take out, so perhaps I should have used the orange pad with either the compound or polish and then the white - but its good enough for now - maybe this winter I'll bring her back home and give it another go to resolve any remaining defects - and address any I re-install this summer & fall.... but for now its good enough. Just need to get a couple of coats of wax on the hull and get it back to the lake for Memorial Day! I believe you’re on the right track, but you may have needed to compound more to remove the pigtails if they are pigtails. Sanding with a DA can leave pigtails, rotaries leave holograms. Mike also recommendes stiff, or sharp, foam pads for the polishing step. The white and orange LC pads are probably a bit to soft for gelcoat. Got the Wrong Product. Because I Ordered the Wrong Product. DOH! By oldmodman in forum Ask Mike Phillips your detailing questions!